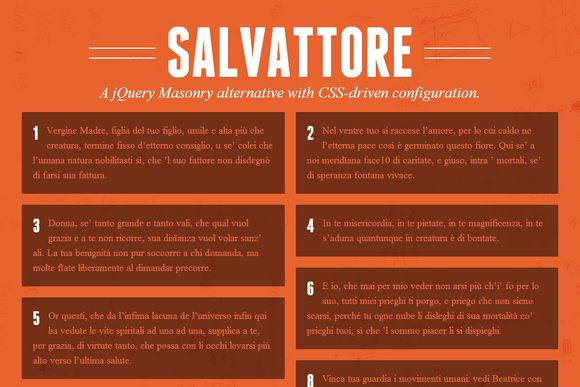 Salvattore is a jQuery Masonry alternative with CSS-driven configuration. Salvattore organizes your HTML elements according to the number of columns you specify. Each of the items in your container is placed within these columns, one by one. To get started simply add a data-columns attribute to the container. In your CSS file you can set the number of columns you want to be created inside that element. To create a responsive columnar design, just use media queries. Items are appended and prepended on the same container without conflicts. You can combine this API with your XHR functions to have a dynamic layout with live content. I want to add lazy loader for the contents inside data-column grid which is inside salvattore timeline. Is there any option integrated in the salvattore plugin? please help!